VALUE PRICED DORM, CAMP AND INSTITUTIONAL MATTRESS. 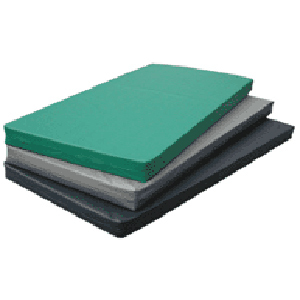 1.0 density polyurethane foam with vinyl laminate cover, available in gray or light green only. 1.2 density polyurethane foam with 10.5 oz. ANTI-BAC™ 3-ply vinyl laminate cover. 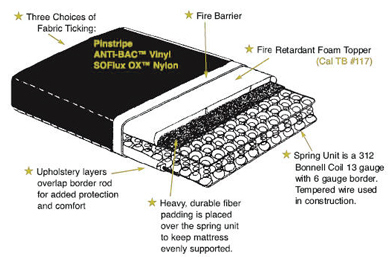 1.8 density polyurethane foam with ANTI-BAC™ 3-ply vinyl laminate cover. 1.5 density poly-fiber core with 10.5 oz. ANTI-BAC™ 3-ply vinyl laminate cover. ANTI-BAC™ fabric is: WATERPROOF FIRE RESISTANT STAIN RESISTANT ANTI-BACTERIAL Colors: Navy Blue– Hunter Green – Gull Gray – Mint Green.